The Déjà vu Band has been delighting audiences with the right mix of showmanship and incredible musicianship since 2003. See them at Bands on the Beach on Tuesday, August 14 from 7-9 p.m. at the Gulfside Pavilion. This Destin, Florida based entertainment powerhouse delivers a wide genre of music from modern country, R&B, and Classic Rock through today’s best hits, with a finesse and energy that leaves audiences wanting more. Déjà Vu is a regular performer at regional festivals and concert series including Destin Harbor Walk, Sandestin Baytown Wharf, Mattie Kelly Arts Foundation, Pensacola Bands on the Beach and Gulf Place Amphitheater among others. 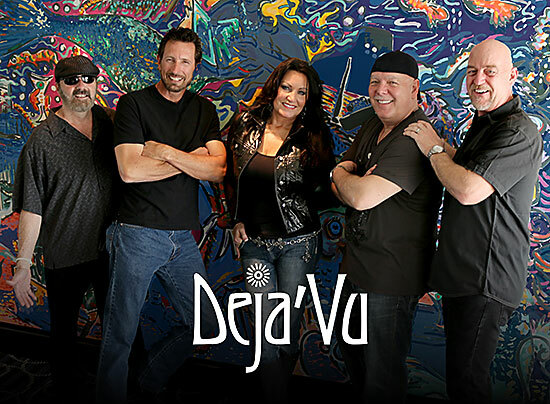 Deja Vu has established itself as the “go to” band for a fun and entertaining music and festival experience.